Book News: Billy Collins' Papers Sold To The University Of Texas : The Two-Way Also: Greg Mortenson to appear on the Today Show; Renata Adler's 1965 report from the march from Selma to Montgomery, Ala.; Nick Laird on poetry. 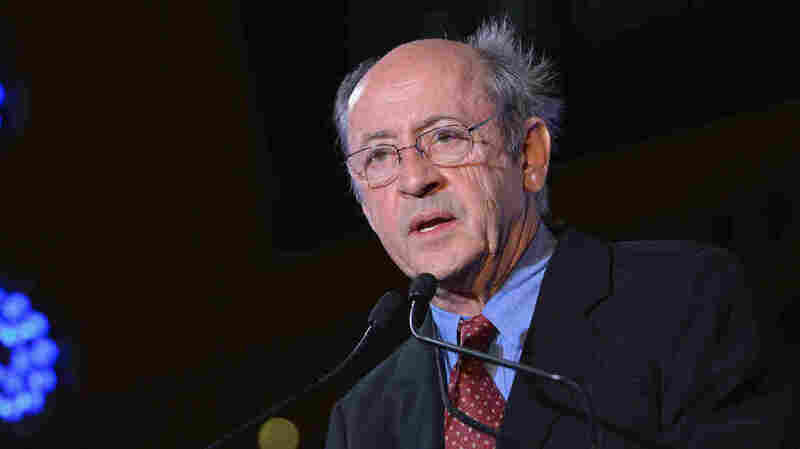 Poet Billy Collins is pictured in February 2013 in New York City. Former U.S. poet laureate Billy Collins has sold his papers to the Harry Ransom Center at the University of Texas at Austin. According to The New York Times, his archives include "dozens of notebooks containing observations, notes, doodles, clippings and extensive drafts of poems, published and unpublished. There is also wide correspondence, audio and video recordings, childhood writings, and diaries" as well as "more than a few jottings on cocktail napkins, envelopes and other scraps. "Collins told the Times in an email: "I remember one occasion when the lines of a poem occurred to me while I was walking around the city with no pen and nothing to write on. So I ducked into a bank and started writing the poem, standing up, on the backs of deposit slips. I used the bank pen that was attached to a desk with a chain, all of which made for a rather short poem. I tried to look very serious as if I were making a monster deposit." In Guernica, Jonathan Lee interviews Northern Irish writer Nick Laird, who says: "Poetry is a way of being alone without feeling alone." In honor of Martin Luther King Day on Monday, The New Yorker unlocked Renata Adler's 1965 report from the march from Selma to Montgomery, Ala. She writes in "Letter from Selma": "By noon, most of the marchers were sunburned or just plain weatherburned. Two Negroes scrawled the word 'Vote' in sunburn cream on their foreheads and were photographed planting an American flag, Iwo Jima fashion, by the side of the road. Flags of all sorts, including state flags and church flags, had materialized in the hands of marchers." Greg Mortenson, whose 2006 memoir Three Cups of Tea turned out to be partially fabricated and who was accused of financial improprieties in managing the charity he founded, is set to appear on NBC's Today Show on Tuesday. In an interview excerpt, Tom Brokaw says, "It still just has puzzled me and why there wasn't, at some point, in your mind, an alarm that went off and said, 'This just isn't right in some way.' " Mortenson answers, "There were alarms, Tom. I didn't listen to them. I was willing to basically kill myself to raise money and help the projects." Mortenson has previously claimed that his co-author, David Oliver Relin, "did nearly all the writing." Relin committed suicide in 2012. For The New Republic, William Deresiewicz reviews Michael Suk-Young Chwe's "abominable volume" Jane Austen, Game Theorist: "Austen, he claims, was a 'social theorist' who 'carefully establishes game theory's core concepts' and 'systematically explored' them in her novels, which are 'game theory textbooks.' This is a perfectly valid statement, as long as we ignore the accepted meaning of most of the words it contains."